What about a giant water slide across the Sound? What about a giant robotic arm that just throws rafts across the sound like skipping stones? Or giant robots that can carry cars across in their ha da! All of which will happen before a bridge or tunnel. While the north shore is fortunate enough to be higher above the water table, the tunnel will still have to go deep while on soil to get far enough under the Sound to reach bedrock. It has dive deep enough once under the Sound to handle the immense weight/pressure of the water above. The Sound is 64 to 300' deep in some areas. 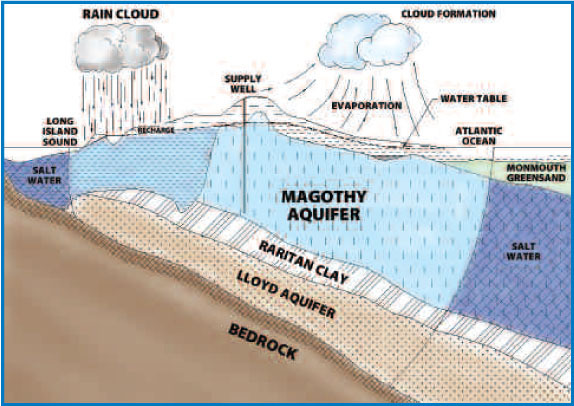 The Lloyd aquifer rests above this bedrock. The Lloyd aquifer is all we have left for clean, untainted, potable water, and it is already being tapped into in a few areas in Nassau and Queens. If, during the driling process, the aquifer is disturbed and marine water introduced, we will have no other means of fresh water. We already pay out the wazoo for electric -- could you imagine what water would cost if it had to be brought onto LI? Afternoon rush hour and weekend traffic we frequently see on the LIE don't seem to be commercial vehicles. They are often families traveling to Brooklyn/SI/Bronx, or the surrounding states. Not necessarily vacation but day trips away. At least those coming from or going to the north won't contribute to that if even a rail from the 135 existed. But the point about having to adhere to a schedule is valid. Most certainly a vehicle tunnel would be utilized the most. The tunneling cost when on land isn't usually terrible (unless you do something like how New York state goes about it with crew sizes two to three times what is standard in the rest of the developed world) and vents and emergency access are easier to make. And there you have the reason why the figure has many zeros and commas. F this place full of greedy and selfish stains on earth. Last edited by ovi8; 06-15-2018 at 11:47 PM..
Why does it go in those places and it going differently? What is that and why do you say it?